A Growing Revolution – Two Great Books about Soil Life! Welcome to our May 2017 SoilMatrix newsletter – A Growing Revolution – Two Great Books about Soil Food Web and Healthy Soil Function! This month’s newsletter contains some valuable revelations gained from two books and two different authors who have keen insights into how to bring soils back to vibrant life and health through building into the “Soil Food Web”. I will share these with you after I describe and show you what is happening in the SoilMatrix Garden right now! There are now five (5) three foot wide beds. The wooden box at the far corner is a bee hive. A rhubarb patch is in the right hand corner, the downspout from the house goes into one of the swales to store water during large rain events. The swales connect with each other and work nicely to create a bottom wicking function to keep the beds moist during longer dry periods. So at this point you must be scratching your heads thinking, what is the SoilMatrix Biochar guy saying here. Isn’t biochar a soil amendment? And didn’t he just say that a full 25% of the soil he just blended is SoilMatrix Biochar? Well yes, that is what I just said. 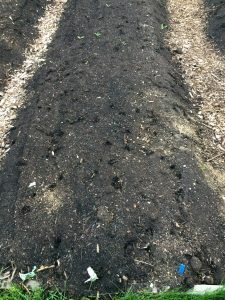 And the truth is, if you do all the things suggested in Jon Stika’s book, you probably don’t need any biochar in your soil to make it healthy and productive. My hypothesis, however, is that soil can be made more healthy and resilient by adding biochar to the soil up to between 20 to 30% by volume. After that there is a significant diminishing return on adding any more biochar. Moreover, once you have this amount of biochar in a soil, it remains there for a long time — no further additions are necessary. 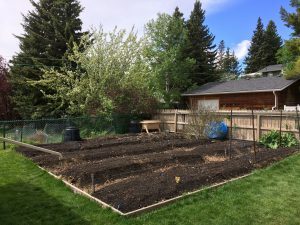 The second part of my hypothesis is that given the evidence from experiments where biochar is amended into soils in ways that work with nature and the soil food web, yields increase and nutrient input requirements reduce. How does this happen? 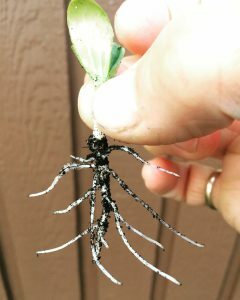 It happens by biochar’s ability to stimulate microbial growth and then protect these beneficial microbes. Furthermore, biochar has the ability to make nutrients more bio-available for both microbes and plants. Future SoilMatrix Newsletters will share the results of numerous experiments that provide evidence of this. For now, let me just say that Jon Stika’s book has significantly changed the way I think about the soil and how the soil food web needs to be nurtured to perform as intended. These earthworm burrows are literally all over. 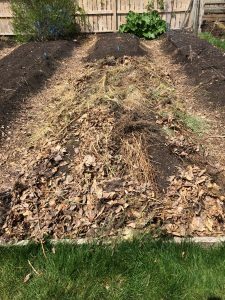 They also extend deep into each garden bed and serve to infiltrate water deep into the garden soil to preserve moisture and make it available to all of the soil matrix and roots. They also serve to keep the soil pliable and aerated so that the soil food web can breath and have much needed oxygen to function. But I have realized something else by observing these earthworm burrows… I need to replace the mulch cover as soon as possible to make sure my earthworms are properly fed. I am sure they come to the top of the soil for a reason. They are seeking organic debris to feed on and since I have removed most of it for seeding, it is missing. This photo shows what I have done to remedy this problem (see below). Not so pretty anymore, but it is far better for the soil to have a covering to protect it from the heat and heavy rains – to conserve moisture and to protect it from compaction. I am still careful to allow the seedlings to come through all this cover. I hope to replace the mulch on the rest of the garden beds as soon as possible. This is a stretch for me because I am concerned about making sure the seedlings get a good start as well. In sum — it is an experiment for this year. In the future, possibly starting this fall, I will be experimenting with cover crops on the SoilMatrix Garden. 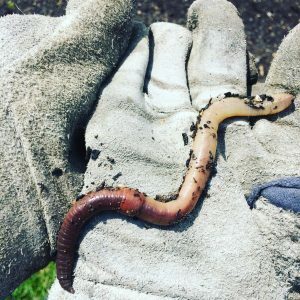 Based on Jon Stika’s book and based on the learning of thousands of no-till farmers, this is an even better option to loose organics on top of the soil. Why? Because of the additional benefit of roots for the soil. You will need to read the book to learn how cover crop roots add even more health to the soil. These are a set of my large work gloves to give you an idea of the size of these animals. I don’t need a rototiller with these guys working 24×7 to generate burrows all through the garden. 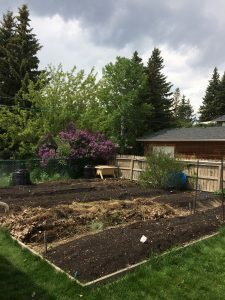 As of May 31, 2017 the garden appears as shown below. I’ll keep you posted as the summer progresses. These two books were game changers for me! They opened the door to understanding soils as living organisms (virtually the sum total of billions of mutually beneficial microbes and insects (arthropods, earthworms, etc.). However neither of these books discussed the potential for biochar amendments to further stimulate soil life and benefit plants. I chalk this up to the fact that experimental evidence for the benefits of biochar for soils has only become available in the past 15 years and these books were written at a time when this evidence was less available. All that has changed and Dr. Montgomery’s most recent book (Amazon link given below) covers this topic more fully. So that is it for this month. There will be a lot more to share as the garden progresses through the summer. Thank you for joining me on the journey of this growing revolution as David Montgomery phrases it. Copyright ©_2017 AirTerra, All rights reserved.